Each year, millions of families make the decision to take a family vacation. The best way to find a family vacation trip that everyone will enjoy is to go to several vacation destinations and there’s no better way to do that than on a Family Cruise . Taking a cruise is unlike any other vacation. For years now, cruise ships have been creating fun, exciting, and safe vacation environments for families, offering a variety of places and options to the traveler. Cruise holidays are a great way to see parts of the world you’ve never seen before. One of the most valuable reasons to consider a cruise holiday is the unrivaled convenience factor. How else can you visit multiple destinations, even multiple continents, while only unpacking your suitcase once? Your room moves around with you, and while you sleep, the ship is still moving to an exciting destination for you to visit when you wake up. Another convenient aspect of cruises is the all-inclusive nature of them. Your meals are cooked and ready for you, entertainment opportunities abound, and you get to take side trips to visit interesting points of call. Not only does the cost include your room on ship, but often also your food, show admission, and admission to the ships pools, fitness centers, etc. Extra costs do come from alcoholic beverages, sodas, etc. Cruising can be a great summer vacation value depending on where you go for your vacation. In addition to convenience, cruise holidays are also a great way to see more than one place during your holiday. Stopping at multiple ports in one week, cruise holidays allow you to see multiple cities, countries, and cultures. You should be able to find a cruise sailing to fascinating places like the Bahamas, Grand Cayman, Bermuda, Alaska, Hawaii, and many other fine cruising destinations. You can enjoy the Alaskan snow or the crystal clear Mediterranean, or even places off the beaten path like Belize or Croatia. Choose a cruise online and decide on a destination which will not only offer you more fun as a family but will also allow your children and teenagers to remain busy so that couples can enjoy couple time in the casino or seeing a show after a quite romantic dinner for two. One of the best ways to take advantage of the variety of locations you can see while aboard a cruise is to combine the cruise itself with shore excursions. These are often day trips around cities and towns, pre-planned by the cruise line, and can often be bundled into one convenient bill with your reservation. A word of warning: while you may be tempted to venture off the ship on your own, you might be better off sticking with the ships area of expertise. Not only will you be able to see more in one day, but you will be guaranteed that the ship will wait for you if you choose their excursion packages. If you go it alone, most cruise lines do not make this same guarantee. Cruise ships are like a floating city complete with its own security staff, leaders, and activity planners. Do you remember watching “The Love Boat” with “Julie” planning the activities? There really are people who plan activities on the ship, as well as people who let you know what to do in case of an emergency. There are tons of activities to do while the ship is traveling that you may never want to leave the boat! The entertainment is non-stop and the fun on board ranges from casino action, to rock climbing to dancing. You’ll find talent shows, games on the decks, on-board pools, fitness centers, spas, and more. In addition, there are a variety of shows and dining experiences to enjoy. Activities aboard cruise ships can be enjoyed by everyone, not matter what their age. 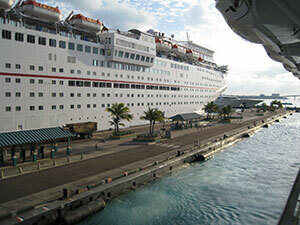 This is because cruise ships offer a wide range of activities geared towards individuals of all ages. You’ll never be bored on a cruise.